Although many think the term Onyx is for the solid black Chaldecony only, it actually comes in banded colors or solid black. If the bands are wavy, the stone may be classified as Agate Chaldecony. Jewelry pendants make great gifts as one size fits all! 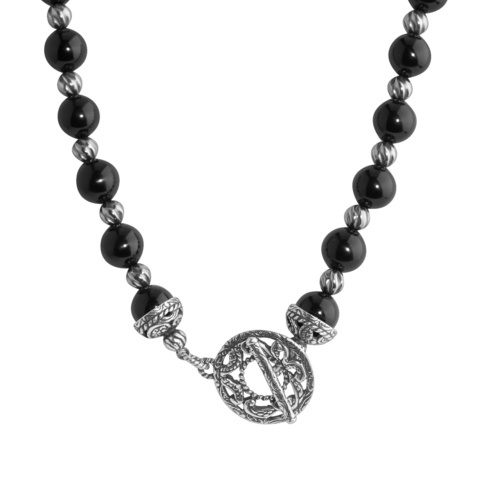 In the embrace of Sterling Silver scrolls black agate has found a lasting relationship. The reverse side features the natural beauty of the rectangular shaped cabochon. Worn on a Sterling Silver chain or black cord, the simple elegance of this pendant makes it versatile for day or evening wear. Also makes a great men's gift. Pendant measures 2-1/4" long x 3/4" wide and has a medium size bail, will fit beads up to 9 mm. Made in America with gemstones from around the world.